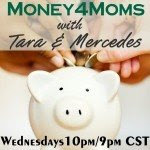 Tonight I'm delighted to be a guest on Money4Moms radio, hosted by Tara of Deal Seeking Mom and Mercedes of Common Sense With Money. We'll be discussing birthdays on a budget! Tune in tonight or catch the recorded show at your leisure. I hope you post some birthday ideas! My girls want a birthday party. They are already "planning" a party, even though they won't be celebrating until this summer. Would love some freugal help! I have read your blog faithfully for quite a few years now, but listening tonight, I feel as if I am really "meeting you" for the first time! I loved listening to you and the other moms talk about the birthday party ideas, and I hope you'll get together with them again and talk about some more topics. Or even better yet, I'd love it if you did your own radio show with guests! Even if there was noise from the kids in the background, it would still be fun. This was fun to listen to! Dang it! Didn't realize you were going to be on there or I would have made a point to listen in!